My Life, My Thoughts, My Words. : Kill A Spider And It Will Rain. So last night my husband and I were packing up our basement junk preparing for the big move next week. I got the job of sorting through the stuff under the steps. This involved looking through the boxes we had sitting there from our previous move, and deciding if what's been sitting in there over the last year (untouched) is really worth keeping. A quarter of the way into the job I came back from sorting through a box and headed under the steps to grab another. About half a step in, sitting on the cement wall less than one foot in front of me, the biggest blackest spider I've ever seen decided to greet me. 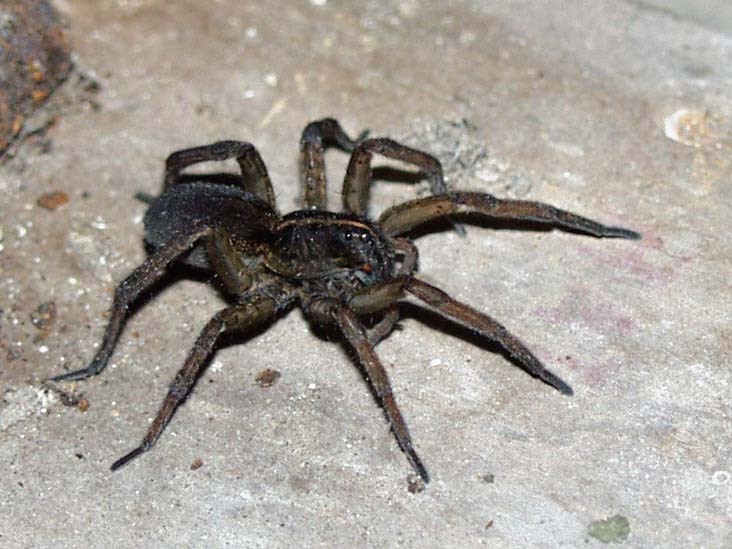 For those of you that don't know, when I see a spider, I scream bloody murder. So, after I saw this giant spider crawl up the wall I screamed like a baby and ran out of the room. Yep, I screamed not once, but about 5 times while I ran up the steps and grabbed a fly swatter for Matt to kill it. Now, I have to tell you that Matt isn't exactly a fan of spiders either. Especially black ones. Every time he sees a black spider he's convinced it's a black widow and it's going to kill him. After a few minutes of getting up the nerve to kill this spider Matt walks over bravely and with one swat the spider drops to the ground.... and then runs behind all the junk I need to move. Now you know when you see a really ugly bug crawling just a few inches away from you and it creeps you out? And for the next 1/2 hour you feel bugs crawling all over your skin? Well that's what happened to the both of us. After debating about if we should just leave our stuff under the steps as a housewarming gift for the new homeowners, we decided there was probably something of value making it worth taking this spider on. The only problem was, not only did Matt miss killing the spider he was now refusing to try again. After demonstrating my frustration with words I won't repeat here I grabbed the fly swatter out of Matts hand and headed under the steps. I found the giant spider sitting on the side of the next box I needed to move, he was an easy target. And then something came over me. Compassion. I thought about how horrible it must have been for this spider to be crawling around like he does every day, and then have me interrupting him by constantly screaming in his face. This followed by someone chasing him around trying to kill him must not be too pleasant. So then I get this idea rather than killing the spider I'll take him outside. Well apparently bugs don't know the difference between trying to save their life and trying to kill them. I spent the next couple of minutes following the spider around with my fly swatter trying to coax him on top of it so I could carry him outside. Every time he'd climb on, he'd jump off. Every time he'd jump off, I'd scream. And every time I'd scream, Matt would laugh. In the end the stupid spider ended up getting squished by accident. I felt bad for killing him and left the situation sweating and breathless from screaming. And this morning I woke up and it was pouring rain. Buckets of rain. Apparently the bigger the spider you kill, the harder it will rain. It doesn't matter if you were trying to save it's life. That's an intense story! Gave me the creepy crawlies. I always end up trying the same thing. I see a spider and want the darn thing dead! I'll usually end up trying to save them... I find a cup or a jar and sliding a piece of card underneath works well. Take it outside, tip it and run away! I admire your bravery for trying to save him with a fly swatter. I loved that story...good good....I can't stand spiders so I can totally put myself in your place here!